1) Butterfly Artworks (from Visions of Eden) Necklace - A gift, this necklace is reversible, one side is green and the other is orange. It's made with silver and real butterfly wings that are collected in the rainforest after the butterflies die naturally. Very interesting handmade piece that really makes use of color and texture while keeping it all enclosed in the small wing shape. 2) Equal Exchange Black Tea - I mentioned Equal Exchange's English Breakfast before, but I think I like this one more. There isn't any mention on the boxes on what different tea (or tea blends) make up these two varieties; this one just seems more flavorful to me. While I still want to find a good loose tea for sale somewhere around here, I'm really enjoying this one. 4) Lacey Sturm's Life Screams - Lacey is, of course, the former lead singer of Flyleaf; I love Flyleaf's sound and I also really like Lacey's style of singing. So while Flyleaf put out a good album with their new singer, I was glad to now also get a solo album from Lacey. It has that same style of singing and that same focus on theme we're familiar with. "Impossible" really makes you think of life in a new way, and the title track "Life Screams" is probably one of my favorites. "The Soldier" is good, too. "Rot" is a compelling picture and message. "You're Not Alone" and "Feels Like Forever" have a good sound (I like the way Lacey puts together lyrics). And "Faith" is very sweet. Somehow "Run to You" already feels so familiar, like something I already knew somehow. This album is sort of a combination of Flyleaf and Memento Mori, with something simultaneously more casual/everyday and more deeply thematic (if those are the right phrases). 5) Sweater Comb - A little late in the season to be talking about this one maybe, but hey, you can always clean your sweaters up before putting them away for the summer. I don't see these for sale much (I got mine at JoAnn's Fabric) but they seem like something that everyone needs. When a sweater starts to get balls on the material, you just gently brush the comb over it and all of that comes off again. A sweater should last a long time, so this little comb lets you keep them looking new. 6) Feather Duster - Another random, housekeeping item. I was getting tired of those bright-colored (usually), ugly, synthetic dusters that look dirty and scary right away. So I thought that if feather dusters are still for sale, then maybe they do work. And I'm really happy with it. It dusts well, and the feathers easily reach into in-between spaces and make it easier to dust over more delicate items. And if it wears out and I need a new one, then the use of feathers is a natural, non-synthetic source. You don't get to see a picture of it because I've just realized that feather dusters look weird in pictures, and everyone already knows what they look like, anyway. 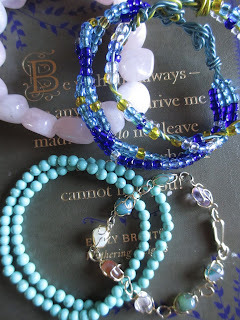 7) Bracelets - Since we've had this early Spring here, I've been wearing short sleeves sometimes during the day, which means it's been time to bring out the bracelets again already. Here are some beaded bracelets and some made with stones. 8) Gardening - February means time to start putting seeds in. Last year, I was able to grow a few carrots that I planed in mid-February, so I'm trying again this year. I also put in some herbs and greens and a couple other things. There's something so delighting in turning soil and putting in seeds and then seeing plants start to grow. 9) Republic of Tea Infuser - I should have taken a picture of this one while it was still in the packaging. Since my World Market tea mug infuser (the ceramic cups that have a ceramic infuser that fits into them) always breaks and also has such small holes that certain kinds of loose tea still easily fall through, I got this one, instead. It's meant to fit into any mug that you already have, but I'm using it a little differently because I don't want my tea sitting in metal for so long. I pour hot water into one cup where I have loose tea just thrown in. Then I hold the metal infuser over a separate cup and pour the water in and put away the infuser. Kind of weird, maybe, but it seems like the best way to me so far. What a wonderful day is today. A morning bike ride in this gorgeous, extended spring weather (I don't get it: February is usually the coldest month here--though there is a 40 degree difference in highs and lows for each day right now). I'm off to see Star Wars again this afternoon. And I have this bar of chocolate to ponder. 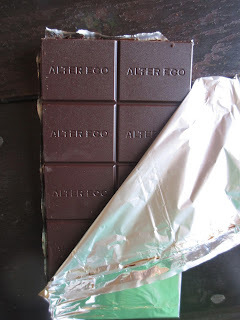 I have general good thoughts toward Alter Eco, though I was having trouble remembering the specific taste of any of their bars--until I realized that it's been years since I reviewed them. So I guess it was about time. It was the title of this bar ("Title?" I'm such a book person) that got my attention. Brown butter? For a chocolate bar? That reminds me of Theo's Bread and Butter bar that I reviewed several years ago. I just had to see what this one would be like. The earthy yellow card box has the right balance of explaining the quality and content of the bar (organic, fair trade, non-GMO, 70% cocoa content) and also enticing you with imagery. Squares of chocolate sit next to partly melted squares of butter until they, too, look like squares of melting butter--until you can imagine them melting also in your mouth. Sweet but also a little salty from the white salt specks that are visible on top. The actual chocolate (sealed in silver) does not have specks of salt. There are ten thin squares (or rectangles, to be more exact) with a fine texture and "Alter Eco" printed on them (there I go again with the book phrasing--the words were most certainly not printed on the chocolate). The smell is almost creamy, in a rich and lightly sweet sort of way. It reminds me much of Alter Eco's truffles (which I get sometimes by the register at Whole Foods and have been meaning to review but they somehow never last long enough to review--someday, though). So is this going to be like a truffle flattened out into a bar? Pretty much. Wow, first you get a taste that is unmistakably butter, then the salt hits you, then the chocolate comes into more dominance. And then the salt proceeds to dance around the edges, while the butter forms a warm and melty center flavor and the chocolate holds it all together. I don't entirely understand it. The texture is just one smooth and cohesive melting chocolate: there is no filling or much of a feel of the grains of salt (you can sometimes tell that they're there, but not much: they're tiny and therefore melt quickly). And yet there is so much layered flavor. The description on the back of the card box is titled "A Bar to Melt Over." It explains that this bar "proves the motto that everything is better with butter." 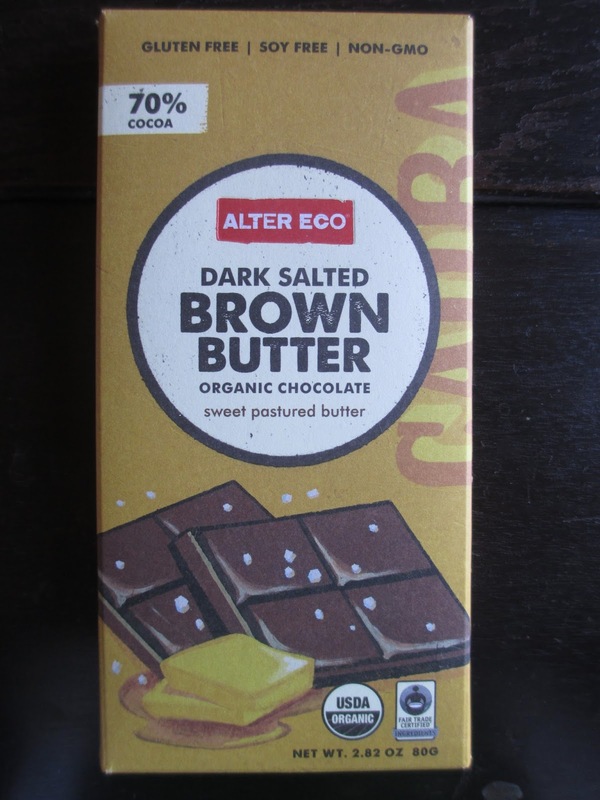 The butter is made from cream sourced from grass-fed, Heritage Swiss cows (in fact, this bar is made in Switzerland, though Alter Eco is based out of San Francisco). And even though I never would have thought to combine butter with chocolate in this particular way, it works completely. Somehow the butter sweetens the dark chocolate and in a more enticing way than sugar does--and without taking away any of the richness. In fact, butter tends to add richness rather than reduce it. The cocoa, in case you were wondering, is sourced from Ecuador, and the salt is Fleur de Sel de Guerande. And when you open up the box, a little note asks you to read inside about how this bar is restoring the rain forest. I do appreciate when boxes are designed this way: it allows you to get info without having to go on a company's website but it also keeps the outside of the box clear for information about the flavor profile of the chocolate (because if a chocolate doesn't taste good, then it doesn't help much that it's eco-friendly because you're not interested in getting it, anyway). I'd like to see more flavored bars like this. Essentially it's a very casual chocolate, something you can enjoy when you don't want to sit quietly and think about flavor notes--and it's also quite good. And in a way, it's almost like a substitute for a truffle for those of us who can't get their hands on many truffles. I would put this bar in a category near Theo's Creamy Milk Chocolate, something that I would want to share with people knowing that they would really enjoy it. Little by little, I've been reading some non-fiction relating to Arizona in the last couple of years. Generally, I prefer firsthand accounts (Vanished Arizona by Martha Summerhayes was fantastic--you can read my post on her book here). But other books are good, too. I picked up Jan Cleere's Amazing Girls of Arizona: True Stories of Young Pioneers a little while ago. And while I didn't think I would be posting on it, I do have a couple of random comments. 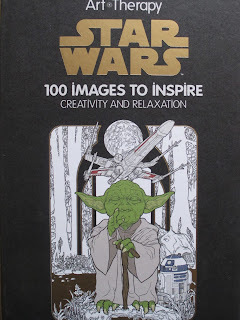 There are eleven chapters, generally around ten to fifteen pages each. Each one focuses on a particular story. Despite the implication of the title, the narratives follow the girls throughout their lives. Usually the chapters start by describing a scene when the person was a child and then everything is told more chronologically from there. Sometimes the area of focus is during the woman's childhood, but in general you get a sense of their whole lives--in brief. So in that regard, this book is similar to Julie McDonald's Unbreakable Dolls trilogy (more polished, though, since Julie McDonald's books were self-published and Jan Cleere's isn't). Also because of the title, I was expecting entertaining, inspirational, awe-inspiring type of stories. But quite frankly, a lot of these were just sad. (I'm not saying that's a bad thing--these are true stories. I'm just saying it isn't quite what I felt the title implied.) What so many of these women went through was sad and not just because of natural circumstances (poverty, harsh weather, wild animals, backbreaking work, that sort of thing is what I mean) but because of people. Anna, who was very established and respect in her community until the KKK came in and got everyone to turn their backs on her. Dowawisnima (renamed Helen), who was forced away from her family (she was Hopi) to go to a harsh school that was basically intended to remove her culture from her (though she did take advantage of the education, the circumstances surrounding it are just wrong). Ruth, who was moved from California to a camp in the desert during WWII just because she was born Japanese. There are so many sad things about this country's history--and even in just this short look at a few women's lives (women who lived for at least a time in Arizona), you see so much of that sadness. So I was thinking less about how resilient these people were and about how they were able to get good things even out of these circumstances and more about how I regret that they had to go through all of this to begin with. There were other stories, too. Atancia, who was married just before she turned eleven, seemed to have a generally good life and to have married a good man (despite how, well, taken aback I was on hearing her age when she married). Even though Edith died rather young (most of these women had quite long lives), she really lived what we'd call a full life. And so on. These eleven stories have covered so many different times and places and perspectives and circumstances for all being about Arizona around the pioneering era. It makes me realize just how varied the state's history is and how many different kinds of people have called this land home. Suffice it to say that Camp Verde is near and dear to my heart. Its a small town with its positives and negatives, but those positives are great indeed. Camp Verde, situated right at the heart of Arizona, is in a beautiful spot of land in the Verde Valley. It's absolutely gorgeous land so that even if certain sections of the town aren't as maintained as other small towns might be, the views from so many houses are well worth it. Camp Verde also has a history of having trouble keeping businesses, whether stores or restaurants (there are some that have lasted but other locations keep switching owners faster than you can keep up). The building that now houses Moscato Italian Restaurant was such a location. The two chefs, Salvatore Moscato and Jenny Robbins, who opened the restaurant met while working in Sedona (the fancy place of the Red Rocks that's home to several good restaurants). But they chose Camp Verde, not Sedona, and I am thrilled that they did. Location-wise, Moscato is on Main Street, right across from Fort Verde, one of the main tourist attractions in the town. Though the restaurant opened just last month, I've already eaten there three times, once for dinner and twice for lunch. What excites me most is that they make their pasta (and their bread) fresh. More people should do this but it usually seems like hardly anyone (out here at least) does. And while Tutti Santi in the Phoenix area is great (really good food, you should go there, too), it's also a little far. Moscato is much closer. This isn't a review; it's more like an exclamation of gladness. That said, they've decorated the place well (work just began on the patio last time I was there). I can vouch for three kinds of pasta, one kind of chicken (I ordered chicken on purpose because it's so easy to mess up and dry out but this one was very good), the bread that comes before your food, the dinner/house salad (with their house-made Italian dressing), their iced tea (I judge restaurants on their iced tea because too many iced teas taste like dirt), their lemonade, and their tiramisu. Now, it is a place where you want to go to take your time (perfect for a weekend evening), so don't expect to finish in a rush. You can take your time here. And yes, it does cost a little more than some places but the thing is, that price is justified because the food is good quality. And you can't tell me that there aren't people in Camp Verde who appreciate quality because I know better (and this is all not to mention the fact that people from other cities or even states will stop here, too, as word travels about). Word's been traveling fast, too. When I've gone for lunch, it's been pretty open, but the restaurant was full on a Friday night. I only hope that they will continue doing well (and providing the same quality that they're starting with) because this is exactly the type of thing I'd like to see in this beautiful, historic town. I was thinking about the first time I read Wuthering Heights. I was thirteen, and I don't remember being particularly disturbed by it or even needing to define or give reason to its plot or its aims (I waited until college to start thinking about its theme). But it was always a story of compelling, memorable characters and settings. Which all reminds me much of my experience with Star Wars. When I was young, I looked at the costumes (which are what define the characters, though I didn't think of it in that way at the time) and at the different locations and sets. I liked the blue milk that Aunt Beru pours, the way that Luke throws the poncho over his head on the way to the Millennium Falcon's docking bay (side note: the only thing that The Force Awakens was missing was a poncho--Episodes VI and I both had ponchos), the pink clouds above Bespin, the way Luke comes out in ROTJ looking all cool dressed in black and using the Force, the green trees on Endor, all of these things were Star Wars to me. And then I got older and started to think about what it all meant--after I had already absorbed and memorized everything. So on to my comparison. I want to cover (quickly) four items. Wuthering Heights (I'll just call them WH and SW) can be confusing to read the first time because it deals with multiple generations and they mostly all have variations off of two or three names. Confusing names aside, SW also deals with generations--and in the same mixed up order. First you see (in SW) the children, then you go back and see the parents, and then you go forward and see the children's children. So both stories blend and constantly reflect back on not only the personal identity of the characters but also their parentage--and the way that their parentage affects them. Sometimes they have a positive legacy from their parents and sometimes it is a negative one. Either way, they're all in it together because they're family and it's the family that the audience is focusing on. SW is an obvious story of good versus evil, with the Force representing both sides and with characters struggling to stay on one side of the spectrum. WH is a little more complicated and certainly less direct: there are characters you would describe as good and characters you would describe as bad and characters that are either good or bad at different moments. But I think you are aware as you read of this concept of different people making different choices about what they do and therefore about who they are. Whether or not WH is a story about good and evil, it is a story that dwells on both the positive and the negative. And both WH and SW have a memorable, ruthless villain. Darth Vader was a legend as soon as he first walked on screen; even though he was almost flat for most of the time (before you learned about who he was and therefore about the conflict that came to define his character), he was so established that it didn't matter. He is powerful and terrifying and unforgiving. Heathcliff is similar in his colorful characterization: you read him and you can just imagine him there and you do not want to ever meet him because he is so cruel. Whether or not you can apply the word evil to him is debatable (as everything is): he sort of just is. He does act evil at many times (though you kind of wonder if Cathy had married him and they had just gone off to live quietly away together if maybe he wouldn't have been that bad--but that's irrelevant because she didn't). Either way, they're both known as villains (unless you've only watched bad WH movies where Heathcliff is portrayed as a lover--yes, there's a love story in WH but it isn't like that at all). Ah, the best part. You know, SW is one of my favorite fictional representations of redemption. You have Darth Vader, a completely evil figure, and you learn that he was once a man and you see him decide that he regrets his choices--and he chooses to forsake his past and become a new person, someone good again. The generation of evil ends with that one choice and he frees his son (and daughter) to start a new era free from the Emperor. In WH, the healing also comes with a new generation. At the end of the novel, both Heathcliff and Cathy are dead and it is Hareton and young Cathy who are alive, finding peace and essentially declaring a resolution to be content, if that is the right way of putting it. They are setting aside the "sins of the father" so to speak and choosing to move on with their lives like regular people, finding some happiness after all that's happened. A new generation and a new start. Both stories have intense imagery, of people, of places, of actions, and of emotions. There is strong conflict and quite a bit of darkness. But in the end both stories find a quiet place, a place where hope can grow even after all the bitterness and hate--and that is the kind of hope that is inspiring, otherwise it means nothing. Oh, and my songs for this post are Breaking Benjamin's "Great Divide" and "Ashes of Eden." I was at Godiva last month and this light pink box just sort of drew me in. 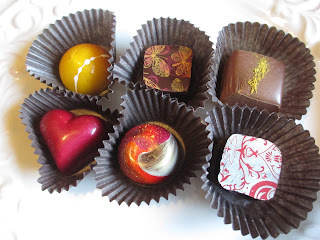 I have a complicated relationship with Godiva, as you know if you've been reading for a while. 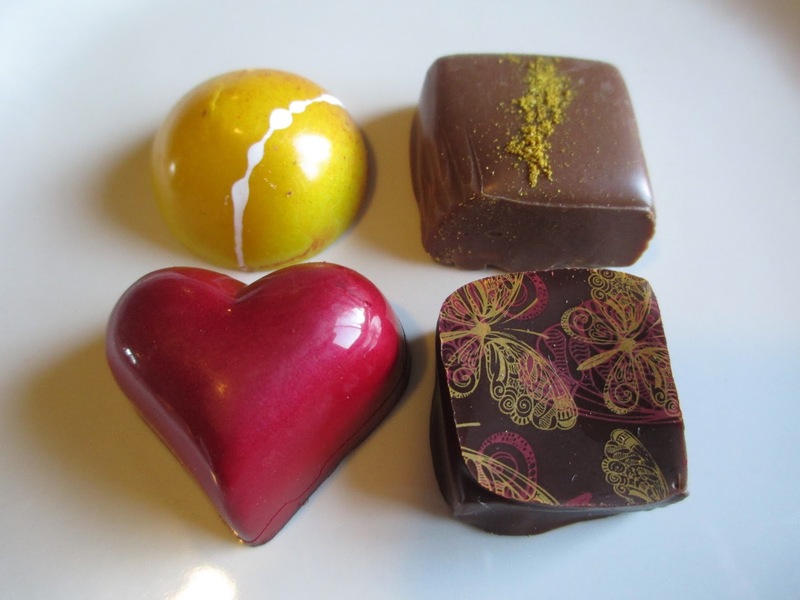 Their chocolate is mass-produced and has a long shelf life, so the quality of their truffles can't be quite the same as certain others that are made with fresher ingredients (and less of them). But some of Godiva's offerings are quite pretty and I do enjoy some of their flavored chocolates from time to time--just because I can buy them easily in store. So I thought that this pretty, plain pink box would be just right for me, something intended to be girly and therefore designed more with flavored chocolates in mind than plainer chocolates (I like plain chocolates, but not from Godiva). When I read the label, though, my mind focused only on "Mousse" and essentially ignored the "Meringue" part. That set me up for some disappointment when I discovered that the nine little chocolates all have a "light, crisp meringue" in the middle. I'll take you through the six flavors individually. Half of them have only one of each, but the Chocolate, Strawberry, and Hazelnut flavors have two of each. It's a pretty safe guess that these will be the more popular flavors, or the ones that people will be glad to have two of. Mousse Meringue Chocolate - This one is made with a 72% dark chocolate mousse and a dark chocolate shell with a light brown swirl on top. It's very sweet for being the dark chocolate in the bunch, but that is normal for Godiva. There is something of a marshmallow taste to it, either in the chocolate's flavor notes or resulting from the interaction between the chocolate and the meringue. So that's an interesting white/dark flavor effect. Mousse Meringue Strawberry - A dark chocolate shell with a pink swirl covers a mousse made with white chocolate and strawberry. If you've had any of Godiva's strawberry chocolates before, this is the same type of strawberry flavor, sweet and light. The thing is, I prefer the regular strawberry chocolate offerings; I think the meringue makes it a little weird in both flavor and texture. Mousse Meringue Coffee - The coffee is in the milk chocolate mousse and the shell is also milk chocolate, with a light brown squiggle on top. The coffee flavor is made in the classic sense, warm and good in the milky, flavored sort of way (which is, of course, what goes best with milk chocolate). The meringue is less noticeable here; it neither takes anything away nor adds anything, making it essentially a neutral and acceptable element. Mousse Meringue and Mandarin Almond - A milk chocolate shell with an orange squiggle on top covers a mousse made with milk chocolate, mandarin, and sweet almonds. Those, plus the meringue, are a lot of elements. The orange paired with the milk chocolates comes first, then the almond flavor follows alongside the texture of the meringue. And it does work, even though these aren't my usual flavors. The flavor combination may be sweet but it all comes across right. It reminds me of some kind of dessert, or probably of Turkish Delight. Not the usual rose kind but the kind made in other flavors with nuts thrown in. It's that type of a dessert flavor. Mousse Meringue Hazelnut Praline - Back to something more simple, a milk chocolate shell with a white swirl on top surrounds a praline mousse. This is back to my favored flavors, hazelnut and chocolate, even if it's all carried out in a very sweet and greasy way. I had trouble biting the little meringue in the middle on this one; finally I was able to get the whole meringue in one bite with only a little bit of the other elements (Maybe you're supposed to eat the whole chocolate in one bite? That would work better). I don't get the point of adding meringue to this one, either. It was okay here; I just don't get why it's there. Mousse Meringue Lemon - A little something different, a white chocolate shell with a yellow swirl holds together the white chocolate and lemon mousse. And here is where the meringue makes the most sense, what with lemon meringue and all. White chocolate always has a texture that tends almost toward chalky; that texture goes well with the crispiness of the meringue. And the very light tasting meringue helps balance out the sweet and tangy flavor of the white chocolate and the lemon mousse. So even though, again, these aren't really my preferred flavors, they work well. And this is at least a case where the use of the meringue makes sense. Overall, though, I find the meringue a little odd. I just wanted a girly and frivolous set of chocolates and I would have enjoyed them more without that odd texture and meaningless flavor thrown in. They would have been softer and simpler with just the mousse and that was what I wanted. The little paper that describes the flavors explains that the mouse meringues are intended to "unite the world of pastry with our classic chocolates . . . combining texture and flavor to surprise the palate." The problem was, the texture was too much of a surprise, and I thought not of dessert but of how I wanted less experimentation in my chocolates. If it works, experimentation is a great thing. But if it falls just short, then I am too disappointed. Sometimes I go fairly often to the Mission Galleria antique store in Riverside, California. I don't quite know how it happens, except that Riverside is on the way out of the L.A. area, so sometimes we stop there on the way back to Arizona. It's a huge store, four floors, and I already know which booths I like to linger at and which floors I pass through quickly. The basement I usually go through fairly quickly but there are sometimes some good things there, all the same: it's there that I found my 1976 edition of Star Wars (the book, that is). And given that it was a little expensive, I looked extra hard at the $1 books on the ground floor to try and imagine that I was evening out the price somewhat. I saw Charlotte Perkins Gilman on the spine and thought, well, I've never heard of Herland (tagline "A Lost Feminist Utopia Novel") but it looks like it might be interesting, so why not? Charlotte Perkins Gilman's short story "The Yellow Wallpaper" is a pretty standard text in literature classes; I wrote one of my papers on it in college. Herland sounds like it comes from the same author: it's the story of three men (explorers) who find and enter an isolated land that is inhabited only by women and has been this way for two thousand years. (The book, by the way, was written in 1915 and my copy was published in 1979.) So basically it sounds like it'll be proving that women are capable of holding their own place in society and contributing in a significant way and aren't necessarily "feminine" in the way that they are considered feminine in contrast to masculine. But when you read it, it's a little different, in part because it is a hundred years old. Certain facts that Gilman needs to establish in 1915 are mostly given facts in 2016. Women can be physically strong, women can build houses, women can be philosophers, even simply women can work. So certain things that may have been a big deal for her to establish at the time passed by very quickly as I was reading them and my focus fell elsewhere. Especially in the beginning, this is basically just an adventure story. It's just fun to read, seeing these three men of different characters setting about on their quest to find this strange land they've heard of--and seeing how they all react to what they see. The women of this land are kind of a novelty, as entertaining to meet as giants or elves or any other type of fiction group. I was curious to learn more about them just as the three men were. And then you see that this isn't just a land of women: it's designed to be like a utopia--a "feminist utopia." Not only is the book trying to prove what women can do, it is also trying to show how a society can be better arranged than ours is. Here is where more of the philosophizing begins; it's still entertaining to read, though, even when you're not quite sure what to make of what the characters suggest. I always have issues with utopias: I usually find them very false with no real bearing on the reality of the world (I basically wrote on my reading reaction in college that Plato's Republic was stupid--not in so many words, but basically). I like real solutions to real problems--otherwise imagining situations that could never happen in the real world doesn't seem at all progressive to me. So I had some of that . . . frustration, if you will, with Herland. But maybe it was less. I think perhaps it was less because the society that Gilman sets up includes so much of art alongside intellect and order. It's nice to see how efficient their agriculture is because their fruitful forests are also so beautiful, and it's nice to know that their houses also look nice in addition to being well-made. Basically this whole book is just a novelty. It was entertaining to read (I know the aims were more intellectual, but time changes things) and quite a good read for a dollar. I didn't realize that there is a sequel--in the introduction, Ann J. Lane essentially tells people not to bother reading the sequel unless you want to study Gilman/her views. So the sequel must really be terrible. If I found it in another $1 pile, I would definitely get it just out of curiosity, but I would also definitely not seek it out and would be content never to read it. That's kind of how this book was: I would never have missed it and I don't exactly suggest that you go out and look for it (unless you're a literary person who's interested in Gilman, the era, utopia, or feminism). But if you happen across it, you might consider getting it as a quick and casual read. Goodness, is it going to be Valentine's Day tomorrow already? 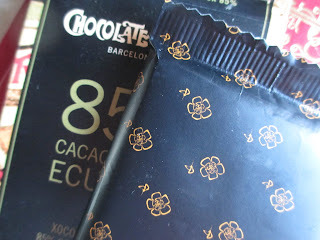 And I just barely have my Valentine's chocolate review up today? (In my defense, I was going to do it yesterday but the Internet was out all evening.) Anyway, Valentine's Day means very little to me (hence its absence from my What Do You Celebrate? series), so it isn't such a bad thing to be so late about it. The chocolate in question today is one of Theo's holiday bars, the usual 85 gram size in the usual paper wrappings (it's just under $4). The design of the wrapper, though, is much simpler than it was for the Christmas bars. The My Cherry Baby design has a simple, red, patterned background with three hearts that mimic a Valentine's Day card or conversation hearts. Underneath is a glossy pair of cherries that form a heart shape with their stems; these cherries remind me of the simple yet effective designs of Theo's regular chocolate bars. Per usual, the bar is divided into eight squares. 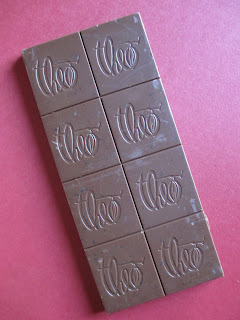 It's also Theo's standard 45% milk chocolate (which I've always seen people love). For the cherry element, there are both dried sour cherries and freeze-dried cherries. Their flavor comes in instantly, possibly even before the chocolate does; after this, the two move back and forth in dominance so that you are always thinking of both flavors at once while still tasting each of them. The flavor of the cherries tastes as if they are freshly dried, nice and flavorful and soft, not oddly or stiffly chewy or crunchy. Just a little tart, just a little sweet. The chocolate is much the same as the cherries in this respect: it's sweet because it's milk chocolate but not very much and it has some nice richness of flavor, too. So the pairing is perfect. It's a nice and simple chocolate and in a way there isn't much to say because it's just right, balanced well and made with great ingredients. Also it is rather nice that Theo has chosen to make this bar with cherries--there are so many strawberry and chocolate pairings around this time of year (which I do, however, like) that it's nice to see something else on offer. Cherries might be a little more of a risk to put together properly but they're carried out so well here that I think everyone will love this bar. I have to say once again how much I love that Theo is making all of these holiday bars. Sometimes you want a holiday chocolate but you still want it to be good. Valentine's chocolate (at least out here) it some of the worst. Cheap, mass-produced, full of sugar and oil, and hardly reminiscent of chocolate at all--and a lot of it's worse than regular candies like Reese's Cups and KitKats. So here Theo has given us another option: good quality, organic, and fair trade (Fair for Life certification) chocolate. In case you were wondering, 71% of the ingredients are fair trade; the exceptions are the cherries, sunflower oil, and rice flour (the oil and flour are part of the dried cherries). The 45% chocolate is perfect, too, because it will appeal to both milk and dark chocolate people because it has much of what is appealing about both types of chocolate. Just a very well done and very well thought out bar of chocolate. It's a good product and it's good for the market. I don't know how I have kept forgetting to put together my reaction to the end of Downton Abbey, even though it's been I think about two weeks since I finished the series. But then once I think on it, I realize that that is exactly why I haven't gotten around to it: before the last season I thought about the show a lot, but after it finished it almost vanished out of my head. This is, of course, not a review, simply a reaction. I think I've done one for each season of the show over the years. Season 1 I didn't care for much, but my attention started coming in during Season 2 and I suppose by Season 3 I was as hooked as everyone else. It's like a gossip show: it's just interesting to watch the characters and speculate about what they will do next. So I did a lot of speculating in between the fifth and sixth seasons. And a lot of anticipating. But then once it was over, there wasn't anything else to speculate about and nothing more to anticipate (I know there is talk about a movie, but as there are no details yet, that's far off and as yet intangible). And when a show is (in a way) built on speculation and anticipation, is there really any way to tie it up in an ending? Now let's start the spoilers. Arizona was so dry of chocolate for too long. Now it looks like there are some chocolate makers coming in at last. Zak's Chocolate opened last year in Scottsdale, and I need to pay them a visit when next I have the chance. 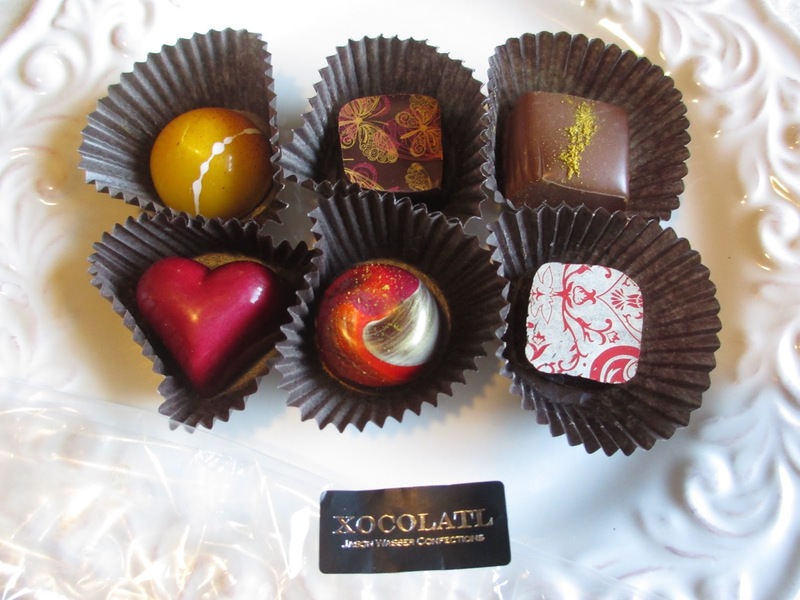 And though I don't know exactly when Xocolatl Confections in Phoenix opened, I imagine it was relatively recently since I hadn't heard of them until yesterday. Yesterday I was at the Glendale Chocolate Affaire, which happens every year but involves more candy and sweets than actual chocolates. This was only my second time going, and I like to go for the antique stores as much as for the chocolate (because, like I said, there isn't much chocolate). Come to think of it, Xocolatl was the only booth I bought anything from (not including lunch, that is). Their booth had two big signs that labeled all their chocolates, the regular chocolates on one side and the caramels on the other side (this event gets very packed, so even as it was, it was a little difficult to look at all the flavors and choose which ones to get). They were for sale either individually or in boxes but since I wanted both chocolates and caramels, I just got them as individual pieces (and what's worse than choosing a whole box and then finding that you don't like any of them? I wanted to try almost everything, but sometimes it is good to be cautious just in case). Caramel (Banana) - I have a booklet that names all of the flavors of the chocolates, but not the caramels. Either they forgot to give me the caramel booklet (since I only got one caramel) or they didn't have one for those. So since I didn't take a picture of the signs, I don't remember the exact name of this one or the description. I just got it because I always get banana chocolates since they're less common. It's milk chocolate with a yellow powder in a stripe on top. Though the caramel looks and tastes great, fresh and light, it turns out that the powder is a very flavorful spice that is not at all to my palate. I should know what it is; I recognize the taste; I just can't name it. The banana caramel is good: the flavor comes off well and the milk chocolate adds a little sweetness. And it's all fine except that I can't take that spice. So this wasn't the right thing for me to try. Venezuelan Noir - Now for something plain, described as "intense 73% dark chocolate ganache made of single origin Venezuelan cacao." The dark surface has a light red pattern with yellow butterflies. The ganache looks smooth and clear and as soon as you taste, the taste hits you with fruity flavor notes. These soon fall into a rich, chocolate taste that has very much of the flourless chocolate effect. The texture, as it looks, is extremely smooth; that ganache is like glass in how cool and flawless it feels. A pretty good chocolate. Bananas Foster - "White chocolate with bananas flambeed in Bermudan rum and brown sugar." After trying the Bananas Foster from Disneyland's 60th Anniversary truffles, I was curious to try another version (and, as I mentioned, I'm always curious to try banana chocolates). This one is painted in yellow with orange specks to one side and a white dotted stripe along the middle. Again, the banana taste is carried out well; the rum taste follows in, then the white chocolate, and then a weird taste for half a second before the white chocolate carries on again. I can't quite put my finger on that weird taste; it's just something small in the background, maybe representative of the cooked sugar. But the truffle captures quite well the exact taste of the plantains that my family fries on the stove with brown sugar. It's decidedly sweet but not too sweet. Without that one small, odd taste, this one would be pretty perfect. Strawberry Kiss - "Creamy milk chocolate infused with strawberry puree and creme de fraise." Apparently, this is one of their more popular flavors, and interest is well justified. Chocolate and strawberry are a classic but they're also done so often that they aren't always done well. In general, it's a forgiving pairing, but that doesn't mean that some pairings aren't much better than others--this pairing is much better than others. The heart is good-looking, nicely molded and painted in a great shade of red with a subtle sparkle to it. Enough to make it look elegant like a piece of jewelry. And the flavor is exactly what you want from a strawberry chocolate. Almost it doesn't taste like individual flavors because they all go together so well and because the flavor basically stays the same as the chocolate melts instead of changing or developing. The taste is strawberry, rich because of the creme liqueur and the chocolate. The effect is sweet and yet rich because of the quality of the milk chocolate. (I'm not certain, by the way, what kind of chocolate Xocolatl uses to make their truffles but it's good quality.) This is the best strawberry chocolate I've had. It's rich without being at all dark, in the sweeter range while still delivering a sophisticated type of flavor. I'm impressed and excited. 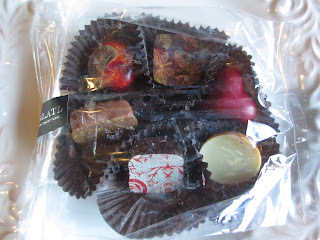 Xocolatl isn't too far out of the way of my usual routes around the Phoenix area, so I can probably stop by their shop when I'm in need of good, fresh chocolates. I know that I just chose the wrong flavor (for me) from the caramels, and two out of the three chocolates were pretty much perfect (the other was almost perfect). So thank you, thank you, this is exactly what I wanted to find somewhere in the state. Do you see this place? Do you walk about on this ground and feel each of your footsteps touching the earth? Do you look up at the sky, the same sky that covers the entire world, and know that it looks entirely unique from here? Do you glance forwards and backwards and sideways and commit to memory everything you see and then later remember it all? Do you imprint everything that you are feeling or thinking to this place, this one place? Place is powerful, as is its connection with us at certain points in our lives. When you visit a place at a specific time (an anniversary, a birthday, a first date, the first time you take your child out of town, after you received news about a new job, etc. ), you will always associate that place with what you felt at that time. I've given happier moments, but it can be sad moments, too: after a family member has died or something of that nature. Either way, the theme in your life begins to meld with the theme of the place. The roses at the Huntington Library strike you with perfection and remain so in every memory of them that you have. The rugged coastline of Cambria is exciting and adventurous, the start of a new era. The Painted Desert is simply beauty, as an image and as an action. I realize that I have always been interested in place. I would read about thick forests and try and picture them in the woods on the drive up to Flagstaff. Or driving down to Phoenix, I would imagine that the fellowship from The Lord of the Rings was walking across the open plains. I could read Charlotte Bronte's vivid description of the emotion of a storm in Villette and feel the very same thing as I watched the monsoons here in late summer. Every book that I like best evokes place so strongly. Sometimes it is a place I am familiar with and sometimes not; other times it is a place that I know is different but always picture as a place that I do know (like my example above of The Lord of the Rings). And everywhere that I go, I think of place. I always want to remember what a place feels like, what I think of when I'm in it, what the atmosphere of it is--what the impression of it is. And in trying to remember these things, each place naturally becomes who I am in that moment that I am there. In this place I am young, I am sad, I am free, I am remembering, I am acting, I am joyous. In this place that I will always remember this way. A whole basket of good chocolate? Really? What graces of product placement made such a thing available to me? How wondrous it is. At least, I hoped it would be. 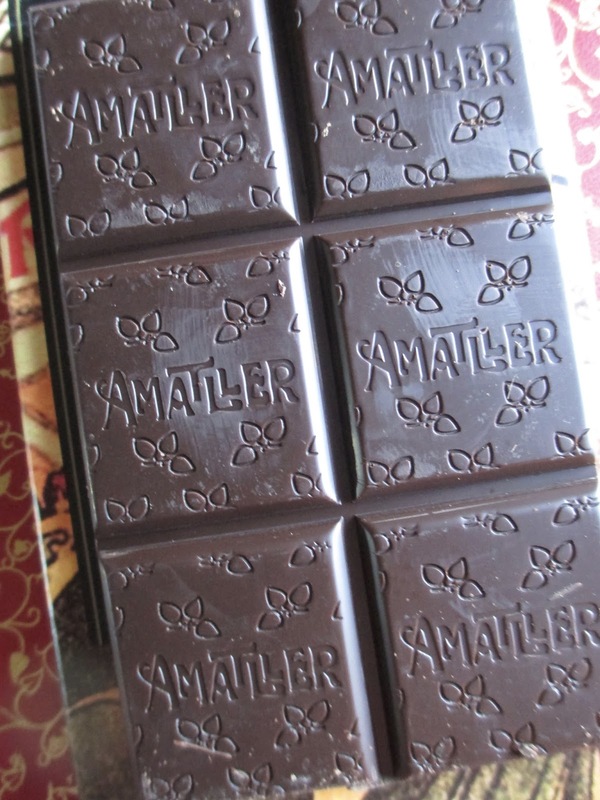 I've had some experience with Chocolate Amatller--not much, just enough to make a positive impression (which is a big deal, though, when you think about it). A box that is more like a deep tray holds two full sized chocolate bars, two small bars, and a little tin of chocolate leaves. Everything is plain, no distracting flavors. In fact, for being a basket (which is generally a festive, glitzy sort of collection), it's all very plain. Yet the plainness is exactly what made me consider this basket promising. I reached first for the little tin. Maybe not everyone would do this, but it came naturally to me as my way of working up through everything. I imagined that the tin would have more casual chocolate as opposed to the bars. Previously, I've had another tin of chocolate leaves from Amatller, except that those were milk chocolate. 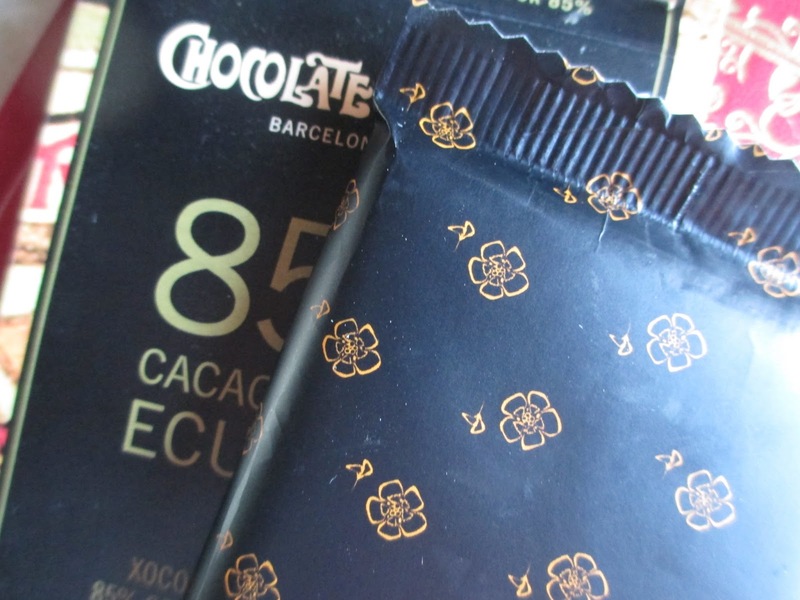 That tin had the art nouveau picture that you can partially see on the small chocolate bars here. These small dark leaves are a completely different shape from the milk chocolate ones, with a little more detail, too, in the veins and all. The taste is of fudge, dark in that sweet/bitter, thick way that I'm not always too much of a fan of. But in this case it's better done, and they are pleasant little chocolates. Next I started with one of the small bars, the 70% Cacao Origin Ecuador. It's just 0.63 oz. The bar looks rather plain after the pretty leaves but is nicely molded. Its flavor is much more floral than the leaves are. This chocolate has more of a delicate sweetness, perhaps with some citrus, too. Essentially it's just a balance of simple flavors, not at all bitter. Sweet in a gentle way that is simply another flavor element. I really like this one: it's lovely, gentle, and fragrant. For the other small bar, the 70% Ghana 0.63, I'll have to pass: I didn't personally try any of it. So we'll just assume that one was good, too. 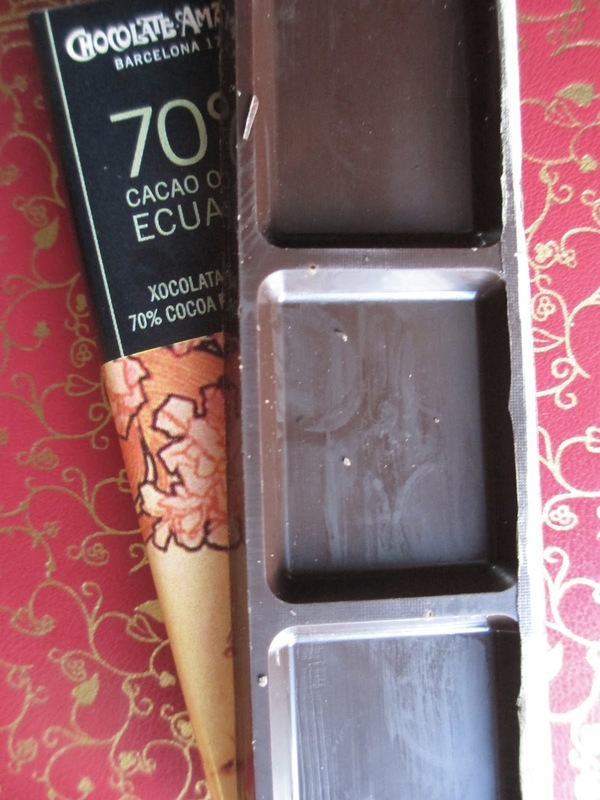 With the full-sized bars, we have the 85% version of the Ecuador. Inside the pretty card box (as opposed to the simpler wrappings of the small bars) is a matte black wrapper with tiny orange flowers, rather a nice change from plain wrappers. The bar is quite pretty, too: all the squares have little leaves and declare the Amatller name in a wacky yet elegant font. As the chocolate begins to melt, you get a slight hint of bitterness followed by a slightly dusty texture. While this texture is a little unnecessary, the flavor is good. It's a continuation of the softness of the 70%, just with more deepness and the addition of bitterness into the flavor profile. While definitely not as delicate as the 70%, neither is it very dark for an 85%. And once your mouth gets used to the slightly dusty texture, you do keep wanting to eat more and more. It leaves a warm, red, rich aftertaste that gives me that particular feeling of wanting more that chocolate hasn't given me for a while. Moving into the 85% Ghana bar, we're definitely moving into darker territory. It's a little more bitter and slightly dusty from the start. The flavors are more of raisins--those dried, darker fruits with less of the sprightliness of the Ecuador bars. The warmth and sweetness increase as the chocolate melts. Then comes a creamy, rich, chocolate taste that's like a very fine dessert, rich and complex. Makes me very regretful I never tried the 70% version. Though it is a little more bitter in the first half than the 85% Ecuador was (which I must warn you about in case it might make a difference to you), this chocolate becomes so tender and wonderful in flavor that the bitterness ends up meaning nothing: the result is worth it. Another very good chocolate. Basically, then, everything's pretty good. The leaves are definitely the most basic, as I had expected given their casual place in the tin. I'd recommend starting with the 70% bars to get a grasp of the flavors without too much seriousness, then moving in to the 85% bars to experience a little more depth. In fact, it was all so wonderful that I hesitate to mention that I used a good deal of this chocolate to make first a batch of brownies and later a flourless chocolate cake. Needless to say, they were both stunning. I just wish I saw Chocolate Amatller around more often. 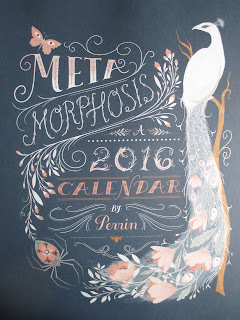 1) Metamorphosis Calendar by Perrin for Anthropologie - I like a unique calendar--but one where the numbers are still big enough to see, otherwise I don't see the point in hanging a calendar instead of just a picture. This one is very pretty, with animals transforming into other animals or into flowers. January had butterflies turning into birds February has a peacock with pink flowers growing as feathers from its tail. Subtle fantasy and elegant design, with a sort of muted colorfulness. 2) Star Wars Aurebesh Translator Ring - There are some Christmasy things still scattered around this list, including this ring, which I'd been wanting for a while. It has the regular alphabet along with the main one from Star Wars; I'm trying to learn it but I just haven't sat down to memorize everything yet (if I did, I'd have it down quickly). So I've been wearing this ring sometimes and just spinning it around to look at all the letters when I have a free moment and I'm already learning. 3) Darth Vader Moleskine - No, I didn't need this notebook, but I have an addiction to notebooks. So. A notebook with Darth Vader is naturally something that I'm going to end up owning. 4) Califia Farms Horchata - After enjoying Califia's almond milk egg nog this Christmas, I thought their horchata might be good, too. They make it with rice milk, tiger nut milk, and almond milk. The main flavor, as it should be, is cinnamon. And it's pretty good. Come to think of it, I don't think I've ever bought horchata from a store. I think I've made some before and I've had some mediocre kinds from restaurants and some very good kinds from other restaurants. This one's one of the better ones (though, sorry, not as good as the best I've had). 5) Fossilized Trilobite - I've mentioned before how I love Discount Gems & Minerals in Sedona. Sometimes they have such great prices on random items. I couldn't pass by this great trilobite. It's nice and clear but not ruined with shine (okay, maybe shine also preserves pieces and gives them an expensive artsy look, but don't they sometimes also look cooler without it?). The fossil itself is five inches long. 6) Jason Jojoba Shampoo and Conditioner - I can't remember if I shared this particular shampoo or just another one I used to use from Jason. I like this one more. Sometimes long hair formulas (from natural brands, that is) tend to be greasier, which is not helpful. This one isn't, though I've been using it for a while now. It has a floral scent which honestly isn't my favorite but is okay. I do find, though, that I use quite a bit more product with this one than with some other shampoos. Or maybe my hair's just getting longer. 7) Star Wars Coloring Book - And now I have a second of these coloring books. This one is a little odd: it's a paperback that has cardboard covers glued to it (and the front cover/title is weird). And the pictures are all in art nouveau style, which works well sometimes but other times is just strange. Still, the good pictures make up for the weird ones and I do like both art nouveau and Star Wars. 8) Petrified Wood Ring - I love it when booths at antique stores have everything half off. This ring is made with a piece of petrified wood. I think the tribe the ring comes from may have been Navajo . . . but I can't seem to remember for sure, which is terrible of me. Anyway, it's a wonderful ring and perfect for me since the Petrified Forest/Painted Desert is one of those places that speaks to me. The ring is tiny, even for me; it can't be bigger than a 4 1/2. So I wear it on my pinkie, where it's a tad loose--I'm thinking it'll fit better in summer (on the opposite side, I have a different ring that feels too tight when the weather is warm). 9) Orange Juice - I've never been much of an orange juice drinker. I can't have sweet things first thing in the morning; they make me feel sick. But I've strangely been craving orange juice lately, so I've been trying some from different brands. The Naked Juice one is pretty good. And no, this still isn't a morning drink. 10) Downton Abbey's Sixth and Final Season - I watched the first few episodes on TV, then was able to see the rest on DVD. So maybe I'll have to do a post on the end of the series soon?